The Latin term Novocastrian is the demonym for those that are born in Newcastle. Novo, comes from the Latin Novus, meaning new. Castrian, from the Latin Castrum, meaning fort or castle. The ‘New-Castle’ was built in 1080 and it was at this time that monastic chroniclers, who wrote in Latin, recorded the city name as Novocastrum, and its people as Novocastrians. The term Novocastrian was born. This term is also used for ex-pupils of the Royal Grammar School. The RGS was founded in 1525 by Thomas Horsley within the grounds of St. Nicholas Church, Newcastle; since then the school has moved five times. The school has been based in Rye Hill, Walker and on the Westgate Road. There is still the old school entrance outside the Long Bar, Westgate Road which is famous for the 1971 film, Get Carter. However, the RGS has occupied its present buildings in Jesmond since 1906. The group was led by Reuben Hodgson, Harry Lumey and George Sanderson who all played pivotal roles in the inception of the club. The club was open to all former pupils and teachers of the school. The club played their first game against North Durham 2nd XV at Felling on 23rd September, 1899; only eleven days after the club had been formed. The next game a few weeks later on 21st October saw Old Novos run out 8-0 winners against Walker (now defunct). Old Novos didn't have a ground of their own but would use pitches in Walker. In 1900, Harry Lumey took over the job as Secretary and through his tremendous efforts brought the Club forward in playing strength and membership. In those early days, Lumey would organise friendly fixtures with now defunct club sides like Houghton Nomads and Tudhoe. In 1906, Northumberland County Rugby was first represented by an Old Novocastrian in Percy Phillips, who played against Durham at Percy Park in a 0-0 draw! Phillips would be the first of eleven Old Novocastrians to be capped for the county before the outbreak of war in 1914. However he had to wait two years before he was joined by a fellow member of Old Novos. In 1908 Buck Stewart, already capped eight times by Northumberland, pulled on the county jersey alongside Phillips against Cumberland. In 1909 Old Novos were facing considerable difficulties, and at that time had only 22 members and no ground. St. George’s Rugby Football Club had a very fine ground and only some 14 members. By amalgamating with Old Novocastrians and being absorbed by them, the St. George’s members were able to carry on playing and the Old Novocastrian Club had an increase in strength which just made the turning point, for at the end of the 1909-1910 season six teams were playing regularly. 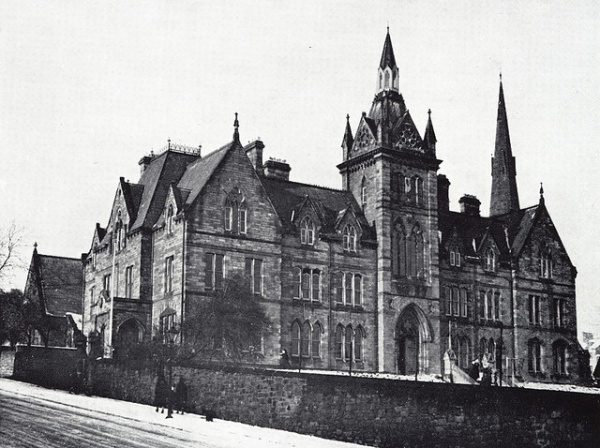 After a year or two the club moved again, to one of the intakes on the Town Moor, now occupied by the Northern Counties School for the Deaf. In 1910, the RGS hosted its first of many senior Northumberland County games. Northumberland had three Old Novos representing them that day in a 17-6 victory over Cheshire. On October 15th 1912, Old Novos had four players representing the county for the first time in a game against Cheshire; a truly momentous occasion for the club. The seasons 1911-1913 were exceptionally good and Old Novos reached the Final of the Senior Cup. Strong teams were fielded and the first team was one of the best in the district. The Secretary in those days was John Bell, and Eddie Watson was a tower of strength in keeping the club together. 4th August 1914, saw the outbreak of World War One, and that week found most of the Club back to school again drilling on the school field for a different sort of game. In November, 1914, 92 per cent of the Club were in the forces. In 1919 what was left of the Club turned up on the school field and started the club going. Novos discovered that their seven year lease of the intake had fallen in during the war and the Corporation were going to take legal action for arrears of rent which they stated we owed! Mr Paul Lazzari the Honorary Treasurer had to raise the wind by demanding 10 shillings from every pre-war member he could find. The debt was paid off and the club was still without a ground. Old Novos were also struggling on the field at this time. At the end of the 1920/21 season Novos 1st XV had won just one match out of twenty five in a primitive Northumberland & Durham Senior Clubs League. Novos again would finish bottom of this league the following two seasons. This led Old Novos to change the club constitution at the 1922 A. G. M on the 24th August. On the proposal of then Chairman Eddie Watson, it was agreed that the rule appertaining to the eligibility of membership be amended to read- that the club be open to Old Novocastrians, that is, old boys of the Royal Grammar School and their friends. The last two words were by the additions made and they make the rule identical with that which prevailed in the pre-war days when the club was so strong. Above: RGS, Rye Hill. The club was formed there in 1899.